Upon arrival at Hanoi Airport, after collecting your baggage, exit the airport to meet your local guide. He/she will be holding a sign with your names on it. 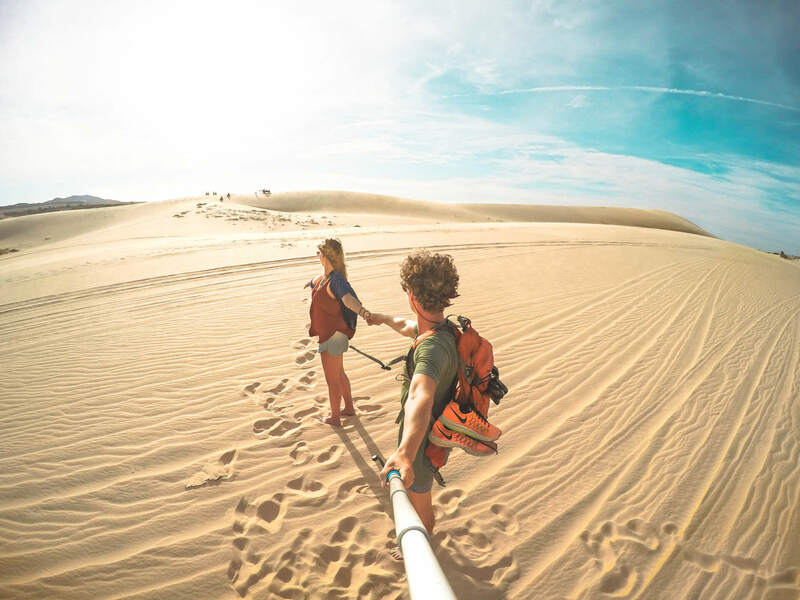 From the airport, you will be privately transferred to your selected hotel. You are free at your leisure in the rest of day. 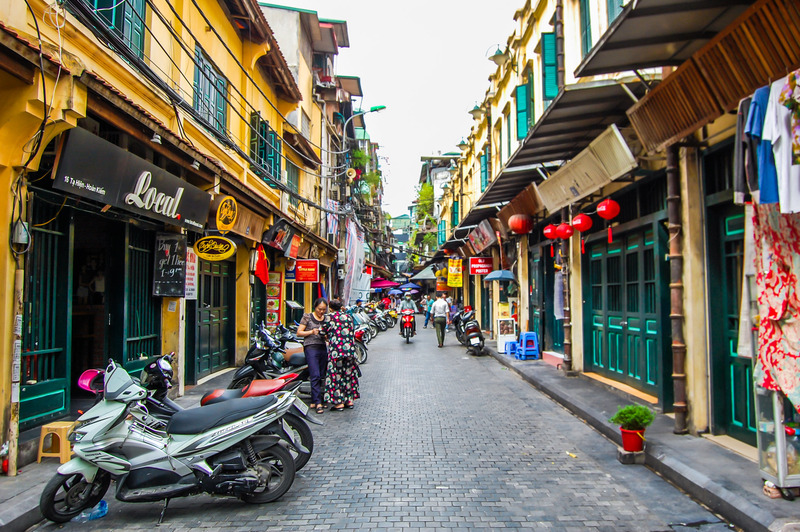 Relaxing at hotel or walking around Hanoi Old Quarter – a network of narrow alleys and shop houses. 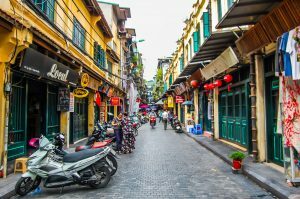 Hanoi Old Quarter is consider a great place to watch local life and shopping. Depart the capital by road this morning for the start of your adventure. 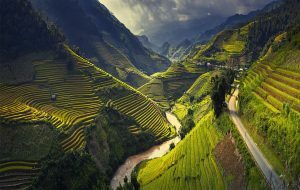 The drive to Ha Giang takes around 7 hours via Tuyen Quang Province, is some of the most breathtaking scenery in Vietnam and along the way you will stop as often as you like to visit small villages and take photos. After the long drive, stretch your legs with a short walk around Ha Giang to a Tay village, set in a picturesque valley near town. Have dinner and stay at hotel in Ha Giang. Accommodation : Overnight at hotel. After breakfast, we have a short visit to Ha Giang Museum before being driven to Dong Van Stone Plateau which stays at the height of over 1000 meter above sea level and home to many tribes who have inhabited here for thousand years and unchanged. A long the way, we will stop at Quang Ba town where you can see a great view from Heaven Gate, Having lunch at the local restaurant before driving towards to Dong Van. We arrive in Dong Van around 2 p.m, checking in your hotel and relaxing for an hour and then we climb to visit Ta Lang village which locates on the top of the hill and have not discovered by tourist. When we are here, you can see how the local people are surprise at you because maybe some of them are the first time see foreigner. Coming back your hotel in the late afternoon, you have dinner at the local restaurant. Breakfast at the hotel and get started for visitting of Dong Van market, where the locals shop for their daily needs.Then climb a pass up to the French Fortress of Pu Lo, which was built in 1890 and evacuated in 1945. 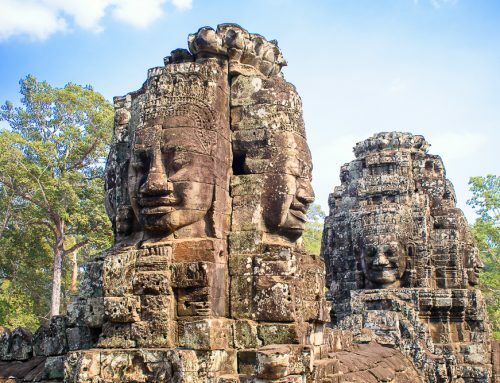 After that, be driven to the most astonishing road in Vietnam, which climbs on 15 km up to the top of the Ma Pi Leng Pass, through a gigantic maze of lime peaks, “stone forests”, and canyons unique in the world. 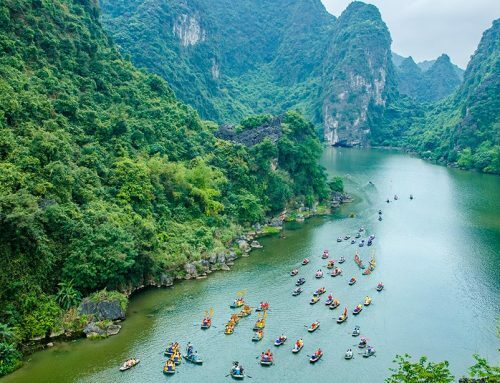 Head down into the valley of Meo Vac, visit Meo Vac market, and continue going through the mountains, cross the river, and arrive in Cao Bang town. Dinner and overnight at the hotel in Cao Bang. Accommodation: Overnight at hotel in Cao Bang. Start early to take the mountain road Cao Bang about 2-hour drive to visit Ban Gioc waterfall (though not full of water in the dry season)., the highest and most spectacular place in the area. 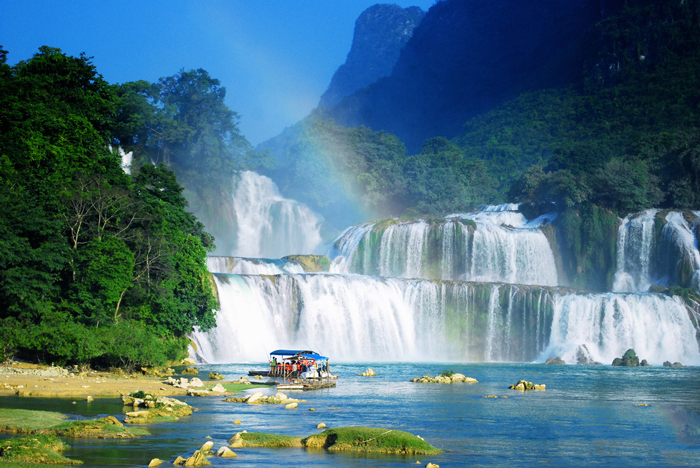 Visit the world’s fourth biggest border-crossing waterfalls is attractive for its picturesque painting of blue sky, great limestone mountains and stunning rice fields together with the daily life. On the way to go Cao Bang town, stop at Phuc Sen wrought village belongs to Phuc Sen commune, Quang Uyen district, Cao Bang province. 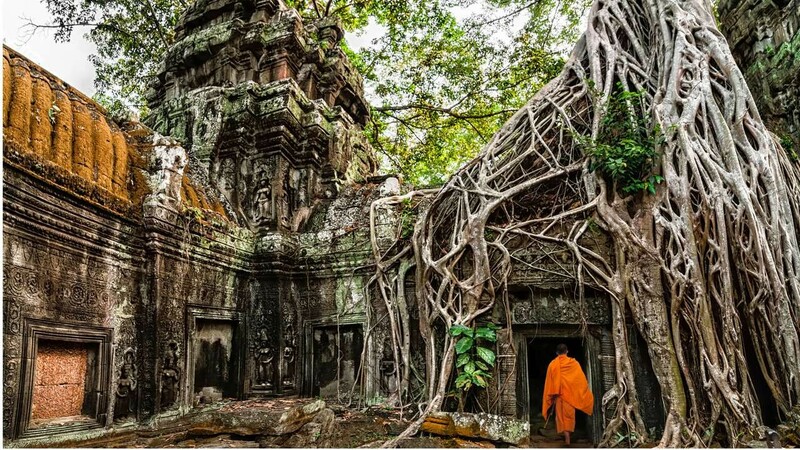 It is a traditional craft village, it was born 1000 years ago. Have dinner at local restaurant. Free time in the evening. Breakfast at local restaurant and then take 3-hour drive to Cho Ra for lunch. 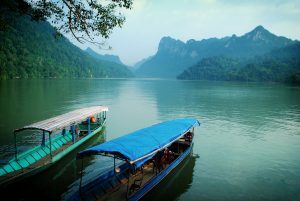 Then get to the boathouse, and the owner will take you through the entire length of the 3 connected lakes (Ba Be – “3 bays”) and up the Nang River, with time to explore the stunning Ba Be Lake, the caves of Puong Grotto where you can explore the stalactites and stalagmites which are a result of the erosion of the river on the karst as well as looking out for the bat colony several thousand strong. The boat then enter into Ba Be lake and visit the stilt houses of the Tay community in Coc Toc village. Dinner and overnight in homestay. Accommodation: Overnight at homestay in Ba Be. Following breakfast, visit some lovely villages and hike up to the upper reaches of the lake in an area marked by the massive limestone cliffs and mountains. On the way, visit Pac Ngoi village where the local people still keep the traditional stilt house. After lunch at a local restaurant, we will depart for the journey back Hanoi, a drive of approximately 150 miles (230 kilometers). We will stop at some hills tea plant before returning to your hotel in the bustling city of Hanoi. Accommodation: Overnight at hotel in Hanoi. 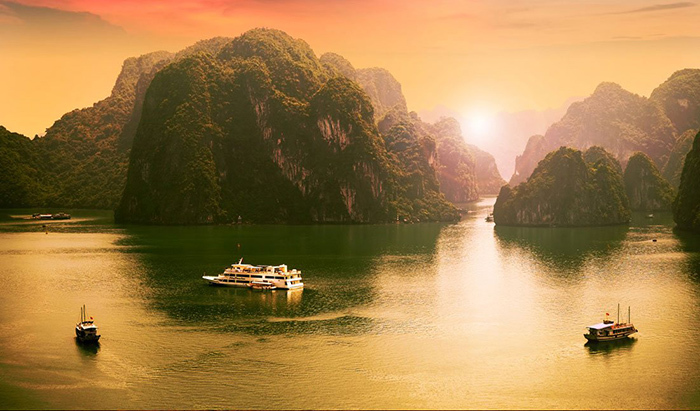 07:45 – 08:15 – Pick up at your hotel in Hanoi Old Quarter and depart for Halong City. 12:00 – Lunch in the restaurant at the bungalow. Enjoy your private time at leisure, relaxing, sunbathing on the beach or using some services available on the bungalow like playing football, volleyball, badminton, play pool, table tennis, kayaking to explore untouched area near by bungalow. 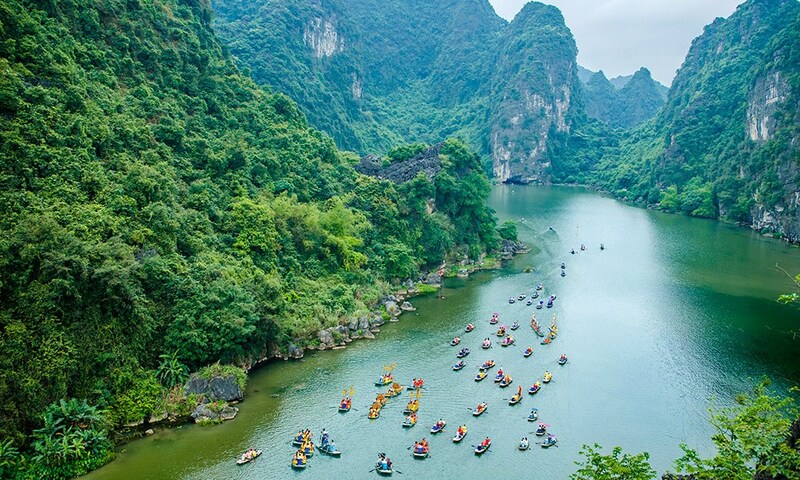 Optional trip (biking trip to Viet Hai village) must be booked in advance, extra U.S. $5/ person. 16:30 – Transfer you back to your hotel.You are free at your leisure in the evening. Discover Hanoi Old Quarter by yourself. Accommodation: Overight at hotel in Hanoi. Morning, start a full day city tour beginning with Ho Chi Minh Complex which features the life of Ho Chi Minh, the nation’s founder. 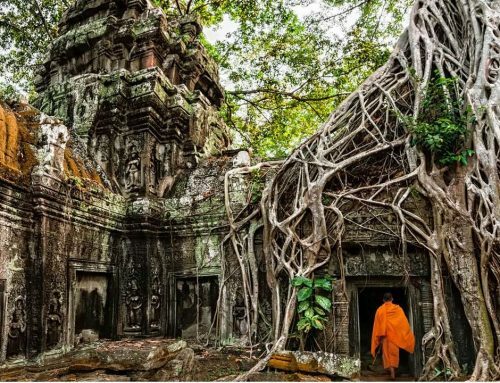 At the complex, visit Ho Chi Minh Mausoleum where the nation’s founder’s body is preserved (closed on Monday, Friday and through October – November) and the rural style house on stilts where Ho Chi Minh lived and worked. Stop by one of Hanoi’s icons, the One Pillar Pagoda, built in the 11th Century in dedication to Bodhisattva Avalokiteshvara or Buddha of Compassion and reminiscent of a lotus blossom rising from a pond. Continue to Museum of Ethnology where contain more than 10,000 objects, 15,000 black and white photos and hundreds of video tapes and cassettes which depict all aspects of life, activities, customs, and habits of the 54 ethnic groups of Vietnam, it is largest and undoubtedly the most interesting Museums in Hanoi and Vietnam. Have lunch at restaurant. In the afternoon, visit Temple of Literature, originally built in honour of Confucius by Emperor Ly Thanh Tong in 1070, a university was added to the grounds six years later. The university provided education to the royal family and children of the aristocracy or “mandarins”. The University remained here until Emperor Gia Long moved the countries administrative capital from Hanoi to Hue in the 18th century. 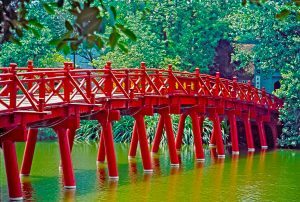 Go to Hoan Kiem Lake, the center point of Hanoi whose name meaning “The Return Sword Lake” originated from a legend of a sacred sword and home to a rare endangered giant turtle species and visit Ngoc Son Temple on the lake. Next, take a one-hour xichlo (3-wheeled rickshaw) tour of the Old Quarter of Hanoi with its ancient streets representing traditional trades from the past. Transfer to Noi Bai airport for domestic flight to Hue. Upon arrival in Hue airport, local guide welcome you and takes you to hotel for check in. After having breakfast at hotel, you have the morning free to do some last minute souvenir shopping. Depending on the flight departure time you will be seen off at the airport 3 hours prior by our English speaking representative. 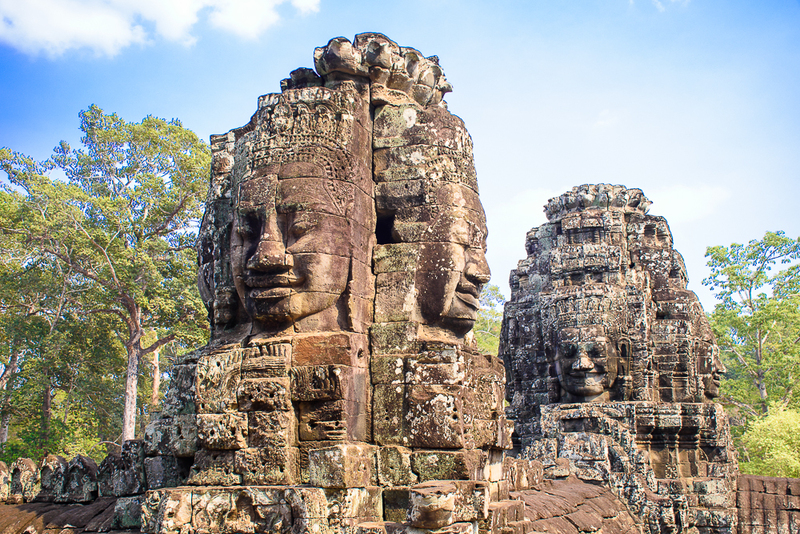 Experienced English Speaking guide guide during all tours and transfers.